Give them the tunes to remember the night and the Martin Mania PR1 will ensure they remember your name. 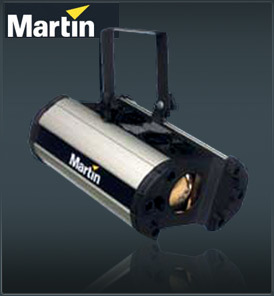 The Martin Mania PR1 is a high precision optic luminaire to herald your image, your logo, your decoration or your message onto any wall, floor or ceiling. With an interchangeable pattern disk (gobo) you can adjust your message to whatever the occasion – clubs, birthdays, bar mitzvahs or weddings. Color filters can also be added and as with all Mania products, there is no duty cycle so it can run all night!.